You may have picked up by now that I have an affinity for Hamilton's military watches. As a former US Navy officer, I guess you could say I view Hamilton's military models as a part of my heritage within "the long blue line". One of the somewhat ubiquitous Hamilton military models is the Model 23 Chronograph. It may be common, but it's certainly not inexpensive. It's a 19 jewel, 16 size stop watch and was paired with the US Navy Model IV octant, as well as a couple of other sextants. The Model IV octant was an aircraft sextant introduced in 1941. 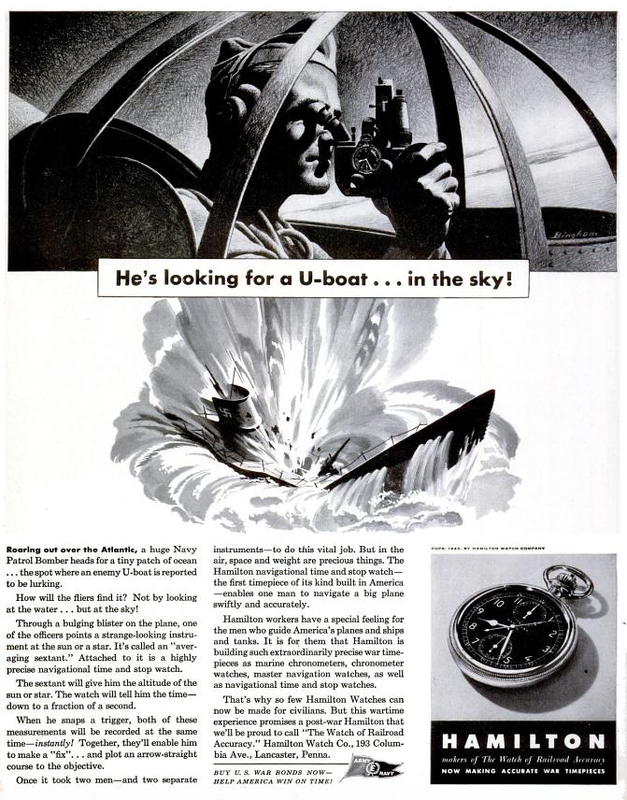 You can see in this Sept 13, 1941 Life Magazine advertisement below that the Model 23 was clipped to the side of the Mark IV octant and a trigger pushed the button on the Model 23 to stop and start the stopwatch. The Smithsonian National Museum of American History has a Mark IV Octant on it's website. You can clearly see where the Model 23 Chronograph would have been installed on the side. Navigators would use the octant to measure the position of sun or stars along with the time of day, etc. and calculate the position of the aircraft. At any given time you can find a number of Model 23's for sale on eBay. The trick, I'm sure, is to get one that is fully functional and in good shape, as getting replacement parts could be an expensive challenge. I finally landed a Model 23 for a decent price (under $400). It needed to be cleaned and serviced but was otherwise in good shape and functional. The register at the 6 o'clock position is the second hand for the watch. The large second hand is the stopwatch seconds and the register at 12 o'clock is the minutes for the stopwatch. So this chronograph records up to 30 minutes. When the stopwatch's second hand makes a full revolution, the minute hand indexes one mark. You push the button on the pendant to start the watch or stop the watch and pushing it a third time will reset the hands to zero. The case back of the Model 23 watches are engraved with the specific contract, etc. for which it was originally purchased. This one appears to have been for the Air Force and the serial number on the movement appears to be post-1944 although dating these movements is tricky. Most online tools based on serial numbers are inaccurate. This case back also has what I assume was an air crewman's name. Chronographs are quite complicated. If you're looking forward to seeing me take this one apart, I'm sorry to disappoint you. I don't have the confidence yet to tackle a chronograph so I sent it out to a pro to handle. Chronographs have basically two levels. What you see below is the chrono-level built on top of the regular watch works. So you don't see the ratchet wheel for the mainspring, etc. that you would normally see on a 16 size pocket watch. If you took the chrono-level off, you'd see the pocket watch underneath. In this shot, looking over the balance and at the the third wheel, you can see it has an extra-long upper pivot with a wheel attached to it. The bridge that says "Model 23" supports the pivot. The extra wheel on the third wheel pivot is always turning when the watch is running. It drives the little gold wheel to the upper left of it. So the two wheels are always rotating. When you engage the stop watch, the upper wheel moves over to the central sweep second wheel, as shown below. Now the watch is powering the chronograph function. As the sweep second wheel turns, it moves all of the other functions until the watch is stopped and reset. Complicated, huh? The Model 23 is really a pretty movement, in my opinion. I've even seen these movements installed in a wrist watch case. A 16 Size makes a very large wrist watch but if that gives new life to these extraordinary watches, so be it. They deserve to be enjoyed. For me, I'll keep this one in it's original form.